Hazel Grace Lancaster is a sixteen year old girl, who is diagnosed to stage four Thyroid cancer with metastasis forming in her lungs. One day when she goes to her support group, she meets Augustus Waters, a friend of her friend, Isaac. Augustus says that he used to have osteosarcoma, has gotten better after getting his leg amputated. As they were knowing more about each other, they suggest their favorite books to each other. Augustus suggested “The Prince of Dawn” and gives her his phone number in the book. Hazel suggested a book, “An Imperial Affliction” to Augustus which is a book that ends half sentence. To figure out how the story ends, Augustus and Hazel goes to Amsterdam to see Peter Van Houten, the author of the book. During the trip, they hear the ending of the story, but they also realize how they feel about each other. They realize that they are in love with each other. However, Augustus confesses to Hazel that his cancer has reappeared and has spread everywhere. However, Hazel tells Augustus that she will love him no matter what, and that she will not trade the short time they have together for anything else. Eight days later, Augustus dies. On Augustus’s funeral, she sees Peter Van Houten. The reason I started reading this book was different from the reasons for the other books. This book was actually a book that several of my friends have suggested to me. As I was reading, I could see the world from Hazel’s view, where everyone is staring at her wherever she goes, and it make me reflect on my attitudes towards people with disabilities. 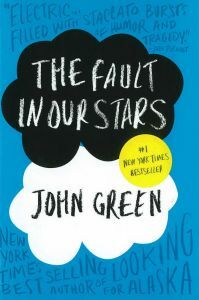 I think the most emotional part of this book was when Hazel was telling Augustus that she will love him no matter what and that she will not trade the short time they have left for anything left. This part was the favorite part of the story, because it made me realize that love is a beautiful thing that will give the strongest courage to anyone. I think this book is perfect for eighth graders to read. I would rate this book as ten out of ten, because it was one of the best books I have ever read. 1. What is the diagnosis of Hazel? 1a. Hazel is diagnosed to stage four Thyroid cancer with metastasis forming in her lungs. 2. Why did Augustus lend the book to Hazel? 2a. He lends the book to Hazel because he wanted to give his phone number to Hazel. 3. Why is Hazel a vegetarian? 3a. Hazel is vegetarian, because she wants to minimize the number of deaths. 4. When and where was the support group held? 5. Why was Augustus at the Support group? 5a. Augustus was at the support group due to his friend Isaac’s request. 6. Why did Hazel want to go to Amsterdam? 6a. It was because she wanted to ask Peter Van Houten about what was going to happen after the end of the book. 7. Why did Hazel cry? 8. Where does Isaac live? 8a. He lives in a small ranch house in Meridian Hills next to a fancy private school. 9. Why did Augustus think that they needed to get the swing removed? 9a. He thought that way, because the swing made Hazel feel depressed and gloomy. 10. Why didn’t Hazel’s mom tell Hazel that she was going to Amsterdam? 10a. It was because she wanted to make it a surprise. 11. On the plane, did they have champagne? If yes, how? 12. Why did Hazel call 911 for Augustus? 13. Why didn’t Hazel’s parents let Hazel see Augustus? 14. Where and when did Augustus die? 14a. He died at the Memorial in ICY eight days after his pre funeral. 15. What did Hazel do in Augustus’s room after he died? 15a. She smelled the blankets so she could smell him.